We have been told that although the force we call gravity has not been directly detected, thereis indirect evidence for its existence. Detectors do exist, but have not yet succeeded indetecting such phenomena. We don´t really care of what is real or imaginary. We want to believe that we find beauty inthe harmony of geometrical chaos. Six artists and artist collectives interpret the capability of us understanding and taking controlover the impalpable of our world. By spinning people around, overcoming our senses or ourmemories, violating boundaries or just being incomprehensible, this exhibition questions whatwe take for granted. With Nautofon (SE/US), Till Nowak (DE), George Avgeros (GR), Lambrini Boviatsou(GR), Manousos Chalkiadakis (GR) and Thanos Kyriakides´ Blind Adam project (GR).Curated by Sofia Mavroudis. Brand new Mare gallery is 200 square meters of contemporary Greek and international art inChania/Crete/Greece/the center of the world. This first season we will present the most interesting that is happening in the art scene for the moment in five exhibitions until October.We are very happy to share this experience together with you. The exhibition catalogue will also be available for download after the opening. 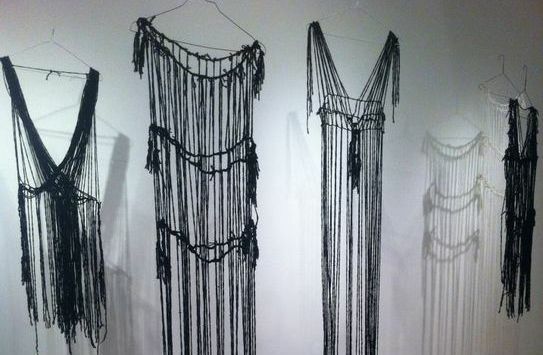 Picture caption: Thanos Kyriakides, Mata Hari Dress (Black), from the project Blind Adam, hand knotted acrylicwool yarn, 180x70 cm, 2010. Courtesy of The Breeder, Athens.